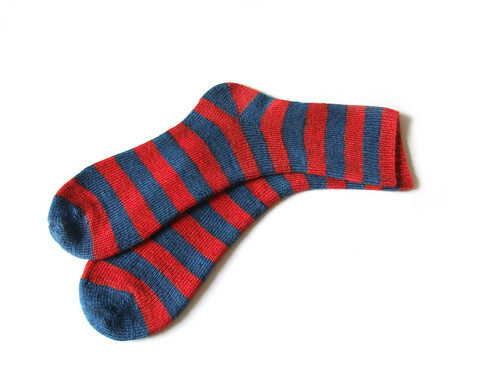 Short rows for socks, part I: Why and when. I mentioned a few days ago my love for short row toes when making socks. I rarely resort to using another toe, and most deviations from my normal short row version have proven disappointing to me. 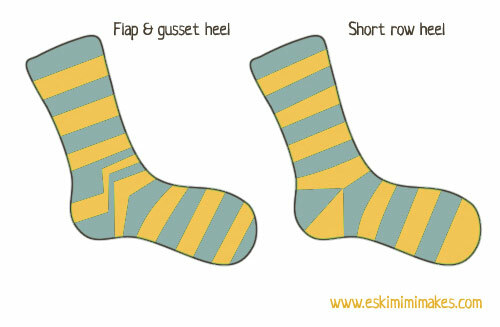 As far as I am concerned, shape, smoothness of fabric and comfort are the most important factors for a good sock toe. Some people may compromise on one or more of these for speed or simplicity of knitting, but if I am going to spend hours knitting a sock then I always believe it is worth putting in the extra 10 minutes to make the most comfortable toe I can. Short row heels are another matter entirely. I’m quite happy to try whatever heel a sock pattern suggests when I am following somebody else’s design. If I am knitting a plain stockinette sock, or a sock of my own devising, then I choose a heel that best fits the design and the yarn. An afterthought short row heel is fantastic for instances where the yarn you are using has a strong pattern of regimented, predictable stripes. If a standard ‘flap and gusset’ heel is worked in this yarn it will break up the steady pattern of stripes on the top of the foot. Other forms of ‘afterthought’ heel may work, but again the smoothness of a heel without decreases makes the short row heel my preferred choice, and the result is both attractive and professional from all angles. Short row toes and heels are also multi-functional – one simple set of instructions will work in all instances where a short row heel or toe might be used. The toe and heel are worked in exactly the same manner, and when you have knit one it is likely that you will never need to consult the directions again. Top-down toes: when you reach the point in your sock where you want to knit your toe, put the bottom half of your total number of stitches on some scrap yarn (you could leave them on the needles, but it makes manoeuvring your needles easier if they are on scrap yarn), knit the short row toe, then kitchener stitch the end stitches to the stitches on the scrap yarn. Toe-up toes: Using scrap yarn, provisionally cast on half the total required stitches for your intended sock circumference, knit the short row toe. 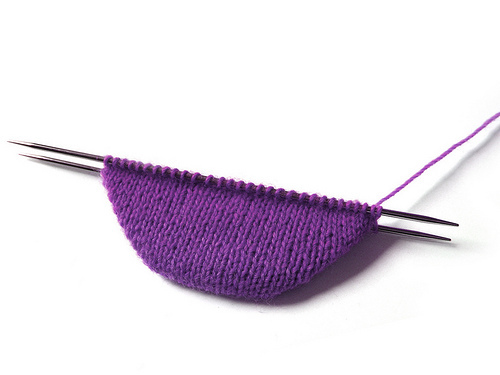 When complete remove the provisional cast-on and place these stitches onto your needles – you are now ready to begin knitting your sock in the round. Top down/toe up heel in situ: When you reach the point in your sock knitting where you wish to place your heel, put half of your stitches (the half intended for the top of your foot) onto scrap yarn. Knit the short row heel on the remaining half of your stitches. Once complete, remove the scrap yarn to free your live stitches and continue working in the round. Top down/toe up heel (afterthought): When you reach the point in your sock where you later wish to knit your short row heel, drop your working yarn and knit across half (the half intended for the back/heel of the foot) with scrap yarn. Drop this scrap yarn and re-knit over these same stitches with the working yarn, and continue to work in the round. When you come to later knit the heel, remove the row of scrap yarn stitches, one by one, leaving two rows of live stitches. Place the lower half of these stitches onto scrap yarn and the top half onto your needles. Knit a short row heel and kitchener closed with the awaiting stitches on the scrap yarn. OK, that’s ace. Now, show me how to knit them. I love the idea of using short rows for starting toe-up socks, but I don’t understand how to start, this thing about casting on half the stitches on a piece of scrap yarn. Why? Could you illustrate this with some pics please?